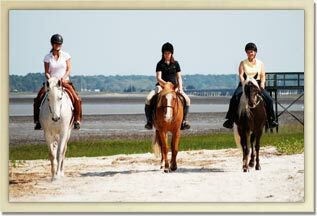 Enjoy the beauty of the Low Country with a horse back ride! 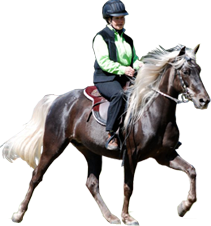 Camelot farms offers two different rides for the beginner to the more advanced rider. 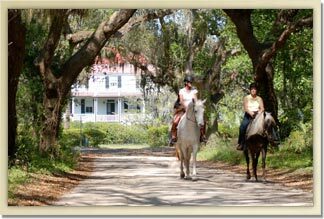 Our Plantation ride wanders throughout our 70 acre farm, down roads and paths past beautiful old live oak trees and island palms. Depending on the time of the year and the weather conditions, this ride takes you on the edge of the marshlands with its wide expanse full of wild life. Our Plantation ride is an hour long. For those with a bit more experience with horses and more time to spend with us we offer a coastline ride to Saint Helena Sound. This is a fun trip for our horses and our guest, as coast offers a new look with each tide change. We also pass an original Plantation house and beautiful moss draped trees. This adventure lasts two hours. Our rides are by appointment only and limited in the number of guest per ride. No children under age eight and a weight limit of 250 lbs. Copyright © 2009 Camelot Farms Equestrian Center and Fine Rocky Mountain Horses. All Rights Reserved.